Michael Singer was asked by the Jewish Community Center in Manhattan to propose a public work of art for the new Samuel Priest Rose Building on 76th St and Amsterdam Ave. Singer designed and fabricated Welcoming Garden, a forty-foot tall narrow vertical sculptural garden. 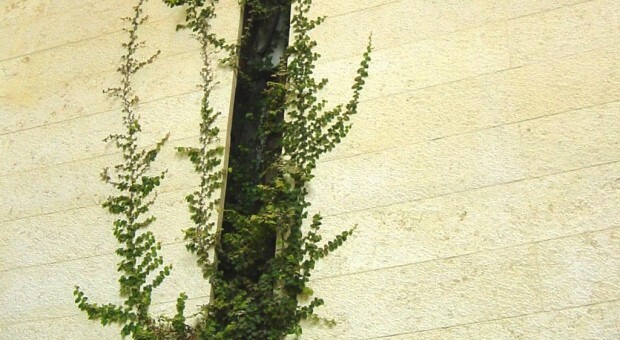 Welcoming Garden is positioned to form a crevice into a multi-storey field of Jerusalem Stone that is located behind the glass façade at the building’s main entrance. The sculpture was envisioned as a hanging green garden that does not come in contact with the floor and is just out of reach of visitors on the landings. Within the thin vertical garden is a series of textured cliff-like sculptural shelf forms made of copper and bronze castings. The garden’s channel extends behind the plane of stone, revealing deeper layers when observed closely. Water flows very slowly within the crevice, dripping from level to level before collecting in a small reservoir. Pockets of Ficus Repens plants are distributed within the 16 inch wide inner chamber and are fed by the slow dripping water. When nurtured, the climbing ficus plants emerge from the narrow opening and form a living tapestry along the face of the stone wall. The project was sponsored by the Jewish Community of the Upper West Side.